Looking for a Sunday lunch in Bude? We have a great selection of pubs and restaurants, so you will easily find something to suit your taste and budget. The Bush Inn serve Sunday roast from 12pm (until it has all gone, which is usually about 3pm). There is a choice of two meats, one always being topside of beef and the other either pork or lamb. For vegetarians, there is a nut roast option. 9.75 for adults and £6.25 for children. The Falcon Hotel offer a choice of six starters, eight main courses (including freshly carved roasted meats, vegetarian and a fresh fish dish along with a few bestsellers) followed by a selection of ten desserts. Sunday lunch is served in the Coachman’s Bar and Tennyson’s Restaurant. Sunday Lunch is served 12 noon till 2.30pm, and choices include beef, turkey and gammon, plus a selection of other dishes including lamb shank. Vegetarian options include a Stilton & walnut vol-au-vent. £9.95. The Brendon Arms serve Sunday roast between 12 noon and 2pm, and offer beef or chicken with either lamb or pork. They are happy to give a selection of each meat too! The vegetarian option changes weekly, and they are happy to offer a gluten free lunch. Adults £7.95 and children £5.95. 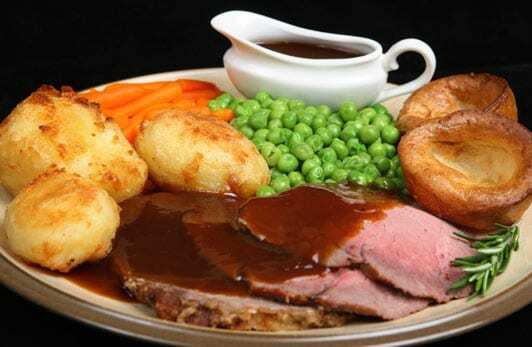 The Preston Gate serve their Sunday Roast from 12.30 to 2.30pm and from 6pm to 8pm. There is almost always a choice of beef and pork, and the vegetarian option is a home-made nut roast. £8.95, or a small portion for £5.50.